A young motorcyclist who died in a crash will "never get to meet his unborn child", his family have said. Mathew Smyth, 25, from Duxford, Cambridgeshire, died after a crash while he was riding his Yamaha on the A1307 in the early hours of Wednesday. 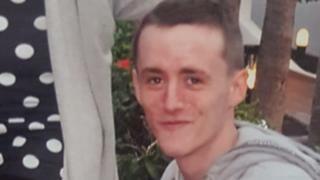 A fundraising campaign to raise funeral costs and to help the family financially has already surpassed its £5,500 target. A man has been charged with causing Mr Smyth's death by dangerous driving. Ricardas Taraska, 23, of Pinder Road, Norwich, has also been charged with failing to stop after a collision and failing to report a collision to police. Mr Smyth had been expecting a child with his partner when he died in the crash near Linton and his family and friends said they were "absolutely heartbroken and distraught beyond belief at the loss of Mathew". "We have lost the most amazing, cheeky, fun-loving young man anyone could ever wish to meet," a statement added. The GoFundMe page set up to fundraise for Mr Smyth's family paid tribute to the "kindness and generosity" of those who had given financially and thanked them on behalf of the family.